The Number Fairy lives in children's imagination, but dream learning is real. Dreaming about kittens helped me to learn numbers when I was a young child. According to Dr. Freud, dreams are our brain's attempt to figure out how to achieve our desires or to understand and face our fears. After I came across this interesting article on The New York Times blog about a research done at Beth Israel Deaconess Medical Center in Boston, I thought about my struggle with learning the numbers when I was a young child. 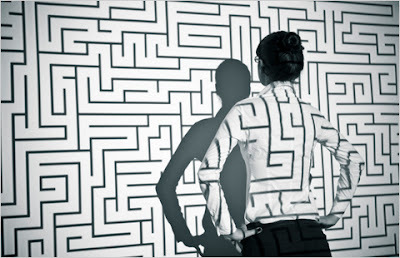 In this research, a maze was shown to 99 volunteers. They were asked to find their way through the complicated, three-dimensional puzzle as fast as possible. After an hour, half of the volunteers were allowed to sleep and the other half relaxed staying awake. The result showed and I quote, "After the resting period, the participants were asked to again tackle the maze. Those who hadn’t napped showed no improvement or did even worse after the break. Nappers who were rested but didn’t report any maze-related dreams did better but showed only marginal improvement. However, four nappers who reported dreaming about the maze showed a startling improvement, cutting their completion time in half. The difference in scores before and after sleeping was 10 times higher for the maze dreamers than those who hadn’t dreamed about the task." This article triggered the memory of my struggle with numbers when I was very young. My parents tried to make me understand the numbers by making me count on my fingers, count toys, pebbles, and used every visual aid they could think of but I still couldn't understand the numbers until I had a dream. I still remember my short dream clearly. 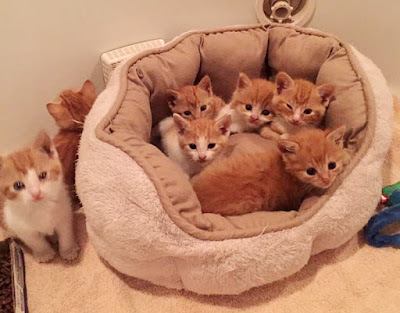 In my dream, I kept moving the kittens in and out of their bed and I kept counting: two kittens are out of the bed, five kittens are in the bed. Then one kitten in the bed, six kittens are out of the bed. From then on, I had no trouble counting anything. 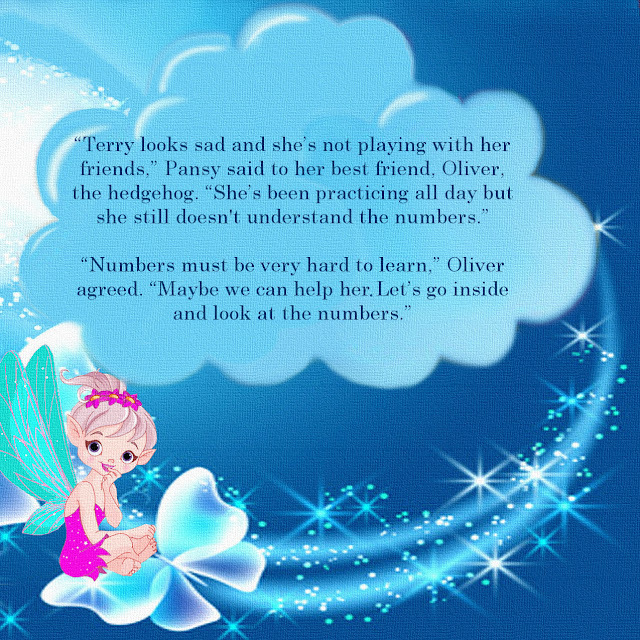 This article and remembering my dream inspired this children's book about Terry struggling to learn numbers and the Mary, the Number Fairy, helping her to understand. When a child is struggling to comprehend the meaning of numbers, they might dream about it after a frustrating day of trying to understand and learn the numbers. Terry was struggling to learn numbers. “I wish we knew the numbers so we could help,” Pansy, Terry’s dog, said to her best friend, Oliver, the hedgehog. The Number Fairy heard Pansy’s plea, and at night, she flew through the window. 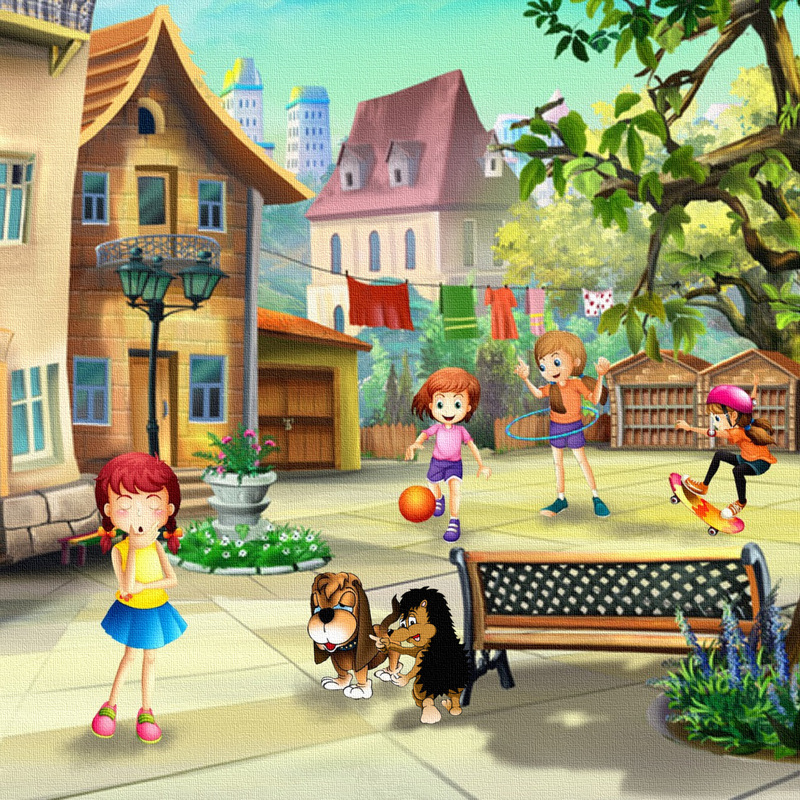 With a swish of her wand, the fairy conjured up a dream bubble and showed the numbers to Terry, and to the animals. From the proceeds, the author donates paperback books to non-profit book charities for children. Charming and delightful reminiscence, Erika, that illustrates how our unconscious is forever at work, trying earnestly to problem-solve on our behalf. And what a satisfying wonder it must be for you to have turned your epiphany about how to understand something puzzling into a picture book that might both entertain and edify kids who might be struggling with a similar problem! Kudos to you. I believe I dreamed the framework for my kids' book SCREAMING WILLIE. I woke up whispering the character's name, and then immediately knew the first story. But that's rare for me. At least the cognizance of the phenomenon is rare. That's why I wonder how often it's happened without my being conscious of having had those "shoemaker's elves" concoct the structure of a story I've later written. My clearest recollection of a dream-based LEARNING situation from youth, such as you describe, involved not numbers but words. I remember being brought to tears, during grade school, over an evening I spent unsuccessfully trying to rote-memorize Lincoln's Gettysburg Address for a class presentation. My dad sagely advised me to give it up for the night, just sleep on it---my hard prep work will cause the speech to assemble itself during the night. Just watch, he urged. And sure enough, he was right. I woke up with a grasp of the piece that astonished me. I never forgot that incident. But I hadn't thought of it for years until now, when your kitty-numbers reminded me. I hope this book brings you back the wealth of satisfactions it deserves. Thank you Ted :) Our mind is still uncharted territory. We know a lot about how it works but most is just educated guess. I think we could compare our knowledge about the function of the brain to how much we know about ocean life. We know a lot about what's going on in the top layer but almost nothing about the deep waters. It is also amazing how we try to grasp our dreams when we're just about waking up. We remember bits and pieces and then we rationalize the fleeting thoughts and feelings by filling the gaps to create a story. Dreaming is definitely important, there are a lot of studies that prove it. Without dreams our brain can't sort events, memories and feelings and store them in the right memory cells to be recalled easily and make the connection between memories. The human brain is truly amazing! Wow, Erika! I love how you used your wonderful illustrations and their accompanying text as an excerpt from Terry and the Number Fairy. This is a cool article. When I'm struggling with a story, I try to go to bed each night thinking about the story, hoping to dream about it and find some answers. When I was a kid, I struggled with fractions and percentages. My Dad taught me in one evening by using pennies, nickels, dimes, quarters, and half-dollars. I passed my arithmetic text the next day without any problem. I guess he was my Number Fairy! Indeed they do, just like Angels. Lovely post Erika. Pictures do help, no matter your age. 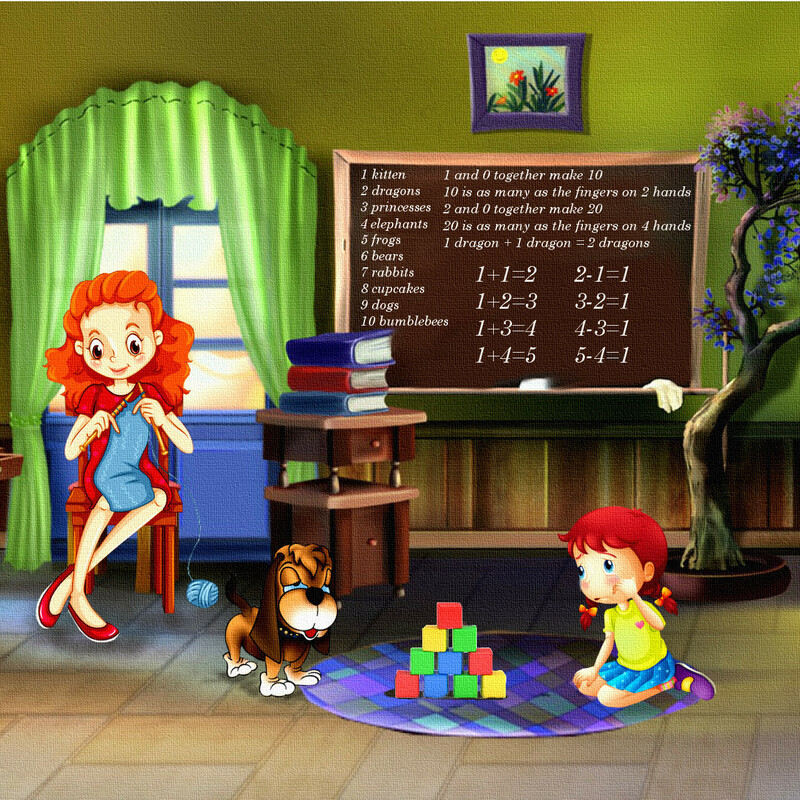 I wish that I was taught my numbers, with fairies. That's really fascinating about dreams, and I definitely believe it's true. Love the sample you provided above of your book. Today on A Small Gang of Authors, Erika M Szabo tells us how dreaming about kittens when she was a kid helped her learn her "numbers." She also gives us some of her excellent illustrations and their accompanying text as an excerpt for her wonderful children's book, "Terry and the Number Fairy."